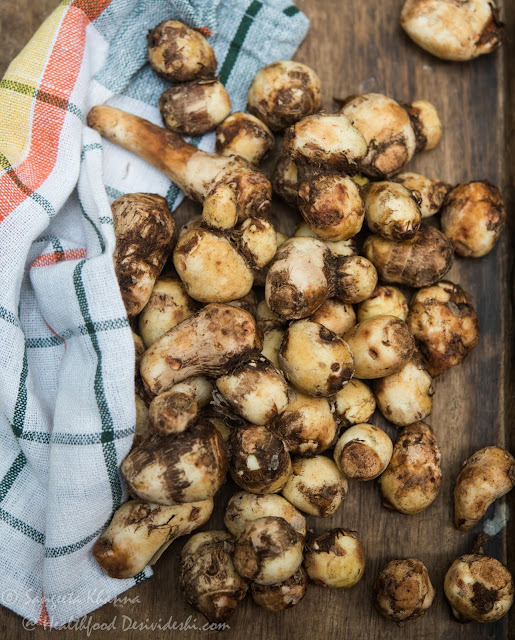 Arbi (Colocasia) corms are not a frequent ingredient in my kitchen though we love Arbi leaves pakodas known as rikwachh. I get some arbi whenever I see fresh and plump corms as this arbi ki sookhi subzi and ajwaini arbi helps break a routine of an overload of greens everyday. 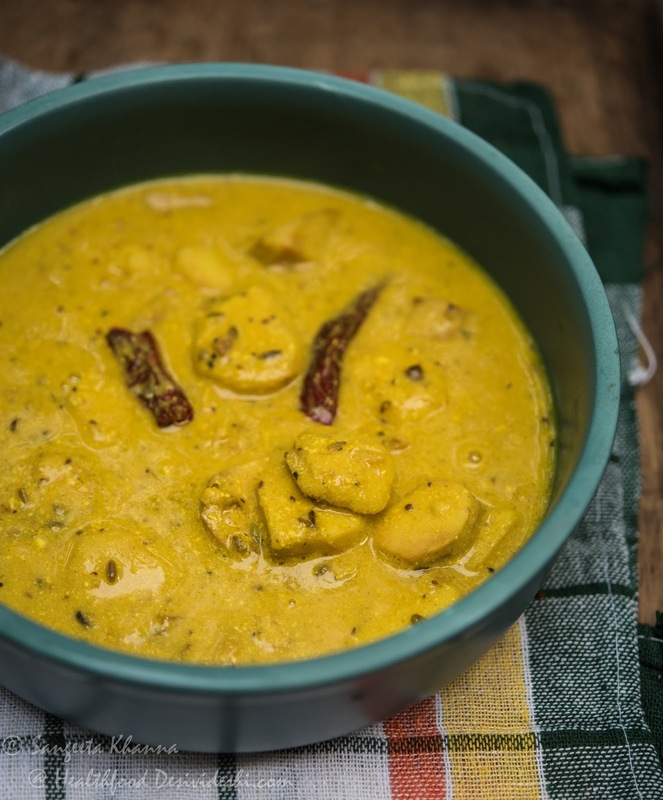 Arbi (colocasia) ki kadhi can also be called as dahi wali arbi but since the consistency and taste of the final dish is similar to a regular kadhi, it is known as arbi ki kadhi. I guess this dish has a Marwari origin but I am not sure, it could be a Kayastha traditional as well. I don't know where did I pick up this recipe as I have been making it for almost two decades. It is quite possible that the recipe was different when I started cooking it and it changed with my own preference. I know at least one family in Banaras who makes alu ki kadhi in a similar way and we make a version of dahi wale alu too but that recipe is quite different in taste and feel. I had stopped making this arbi ki kadhi as well for some reason. The preference is always some green seasonal vegetables so the root vegetables get ignored in my kitchen. Recently I realised the cook who works part time for me is always happy making kadhis and makes nice Sindhi kadhi, tamatar ki kadhi, punjabi kadhi and my version of Banarasi kadhi as well. I was reminded of this arbi ki kadhi because of her and then I decided to teach her this version too. I have been teaching her the simplest of recipes so she can cook my kind of food, else the cooks make some punjabi mishmash most people like and have become dependent on ready made masala and sauces. Coming back to the arbi ki kadhi, it is made without any besan (chickpea flour) in it mostly. But you can add a teaspoon of besan or wheat flour dissolved in water to prevent the yogurt from curdling if you feel so, this process was called as Aalan lagana in older times. Chop the boiled and peeled arbi in thick slices and keep aside. Whisk the yogurt with turmeric powder, cumin and coriander powder, salt and keep aside. Heat the oil, add asafoetida and other tempering ingredients one by one in that order, keeping the flame low. Once the tempering is aromatic add the sliced arbi and stir to mix. Cook while stirring and mashing some of the arbi so it becomes a little pasty. Note that you want only some of the arbi to get mashed and keep most of the arbi slices intact. The mashed part of the arbi will help thicken the kadhi. Add the crushed Nagori methi and mix well. Now add 1/2 cup of water and let it come to a soft boil. Keep the flame low and pour the yogurt mix slowly. Simmer for 10 minutes, adding some water if required. 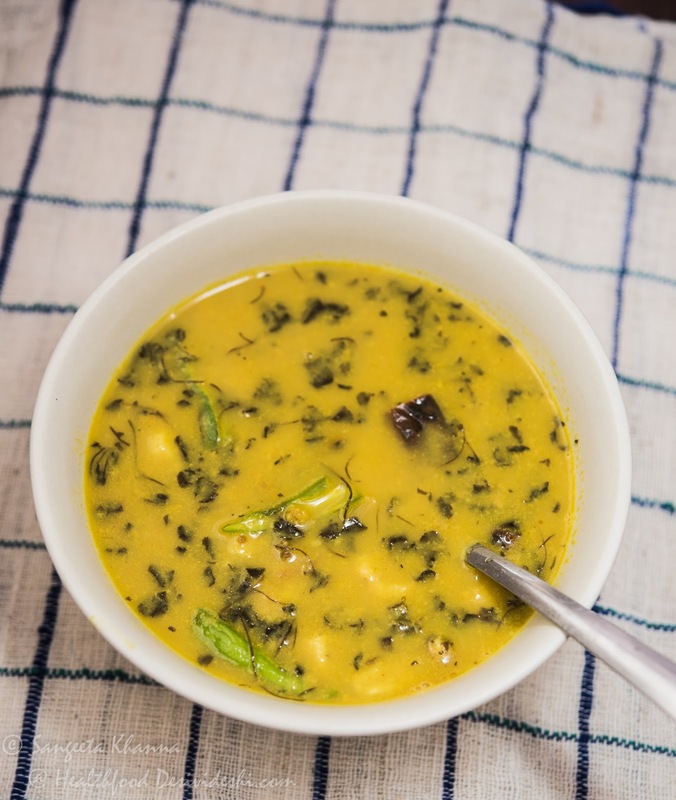 Serve hot with a little ghee on top and a few slit green chilies if you wish.. You can finish the kadhi with a final tadka or red chili powder heated with ghee. This arbi ki kadhi tastes great with plain roti or boiled rice and makes a great side dish for elaborate Indian thalis. familiar.I make a similar subji at home called rasedaar arbi with ajwain and the basic spices. Will make it now with the tempering which, looks very interesting. Thanks Chetna. Yes ajwain ke rasse wali arbi is also popular, I make arbi rarely so don't get to repeat them all.